Hello everyone! It’s Polly Karen here and I’m back to bring you another SUPER-sized special edition spotlight post! If you missed the first MOC7 Spotlight post for days 1 through 14, check it out HERE! I actually can’t believe that we are on our LAST DAY of this year’s MOC (Month of Challenges) I am once again blown away by the creativity bursting out of our gallery this year! I so love seeing how differently everyone interprets each day’s challenge. 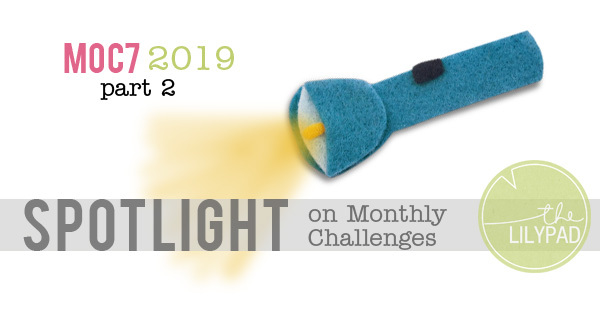 Once again I’m going to do my very best to pick two for each of the 17 challenges that have been posted for the second half of this month… but I didn’t do that well the first time around, so…. yeah. Ha ha! I’m ready to dive in with my picks. I hope you enjoy this massively large and full-of-awesome post! Ok, so I was completely biased by Day 18 because that was the day I was privileged to host a challenge and I had a special interest in seeing how everyone interpreted my challenge. ha ha! But overall I didn’t do too bad at sticking to 2 (cough 3) amazing layouts per day. I’ve linked all of these layouts if you would like to leave these artists a little extra love. Finally I’m very excited to say that while many of you (me included) are terribly sad to see the end of our amazing MOC event, we are cooking up a little something new to keep you guys all scrapping next month and into March! Keep your eyes peeled in the forum and newsletters for more information, but I think you are all going to love our next big scrapping project/event/hoopla! I will also be back on the blog in a few days to show off our new batch of challenges for our regular monthly challenges for February. TOMMORROW- LAST day of MOC07-What Will It Be? Thank you so much for spotlighting my Rainbow Colors page!! I have an update to the journaling: Melissa (my daughter) gave me a gift! I was showing her the page and lamenting that I didn’t save the book or the stuffed animal. She ran upstairs and came back with both the book and Babar!!!! She had saved them! Thanks so very much for picking my Day 21 page for your spotlight. It means a lot! Beautiful choices Karen.. I know it was tough to choose but all that goodness !!! Thank you so much for the spotlight Karen!! Whoohoo! Thank you so much for picking my Day 27 (Big & smalls) page for your spotlight. I’m very honored! Wow, so much awesomeness! The gallery has been so full of wonderful layouts, so I know this post must have been hard to make (just like the previous Spotlight!). I’m honored you chose my Reflection layout!